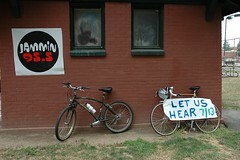 When some cyclists got wind of a Jammin 95.5 picnic event at Grant Park on Saturday many in the community urged them not to attend. There was a concern that if any cyclists showed up it would just incite the radio station's fans and tarnish an already tense situation. Jasun Wurster disagreed. He thought a public park was the perfect place to peacefully demonstrate the community's concerns about the situation, so he organized a bike picnic. Wurster set up a website with information and notified the Portland Police Bureau to make sure they were well aware of the situation and his intentions (they were). I wasn't sure what to make of it, so I decided not to fully promote the picnic on this site. Instead, I briefly mentioned it and gave people a link for more information. On the day of the event I rode over with my girls to see how things were going. Turns out it was a very positive protest. 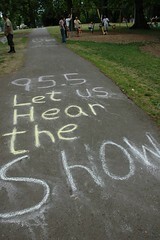 Wurster was there, along with just a few other cyclists, painting signs and writing chalk messages on the paths. He had some music playing, blankets spread out, and frisbees to throw. I surveyed the scene and noticed station manager Tim McNamara among the crowd so I decided to introduce myself. Unfortunately, even though we've had several civil phone conversations, it was obvious that McNamara didn't feel like talking. After our initial greeting, he quickly launched into his anger at the chalked messages, accused cyclists of hate speech, then turned his back and walked away. 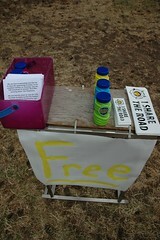 Meanwhile, Wurster had set up a table with free bubbles, lollipops, I Share the Road stickers and an informational flier. The flier, created by Wurster, explained why he was there on one side, and had an open letter to McNamara on the other. Overall, I had a very positive experience and I admire Wurster's efforts in letting the station and their listeners know how he feels. 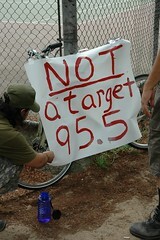 At one point I even noticed him talking with a 95.5 employee as the guy grabbed an I Share the Road sticker. 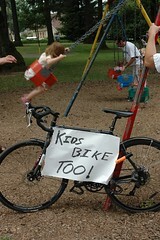 For Wurster's account and photos of the picnic, check out his report.